The following will have Lenten dinners on all the Fridays of Lent, except Good Friday. Sacred Heart Church, 312 N.E. Freeman Ave., Topeka, will have fish or shrimp dinners from 4-7 p.m. in the church hall. Cost is $8.50 for adults; $4 for ages 12 and under. Carryouts are available by calling (785) 234-6727. For more information, go to: www.SacredHeartStJosephCatholic.org. Most Pure Heart of Mary, Topeka, will host fish dinners from 5:30 – 7 p.m. in the parish center, 1750 S.W. Stone Ave. Suggested donation is: $10 for ages 11 and older; $5 for ages 4-10; and free for ages 3 and under. Maximum is $35 per household. Knights of Columbus Council 1372 will host Lenten dinners from 5 to 8 p.m. at St. John the Evangelist Church, 1234 Kentucky St., Lawrence. There will be fish, fish tacos and vegetarian lasagna. St. Michael the Archangel, Leawood, will host its annual fish dinner sponsored by the Knights of Columbus Council 12577 from 4:45 to 6:45 p.m. Menu items include smoked salmon, fried shrimp, breaded tilapia, shrimp pasta and cheese pizza. St. Joseph Church, Nortonville, will host Lenten dinners from 5 to 7 p.m. Menu includes fried fish, baked fish and fried shrimp. Cost is: $10 for ages 11 and older; $5 for ages 4-10; and free for ages 3 and under. Knights of Columbus Council 10407 will host fish and shrimp dinners from 5 to 7 p.m. at the Divine Mercy Parish Christian Formation Center, 555 W. Main St., Gardner. Cost is: $10 for adults; $5 for children 10 and under. The Holy Spirit Parish Knights of Columbus are offering all-you-can-eat seafood dinners every Friday from 5 to 7 p.m. in St. Elizabeth Hall, 11300 W. 103rd St., Overland Park. Cost is: $16 for shrimp and fish for adults; $10 for fish for adults; $5 for children ages 4 to 10; and $1 for children under 4. Queen of the Holy Rosary Parish, Wea, 227th and Metcalf, will serve fish and boiled shrimp dinners with a dessert bar from 5:30 to 7:30 p.m. Cost is $10 for adults; $5 for children. Shrimp is $15. Good Shepherd Knights of Columbus 11126, 12800 W. 75th, Shawnee, will host fried and baked fish dinners from 5 to 7:30 p.m. Cost is: $9 for ages 12 and older; $8 for seniors 65 and older; $4 for children ages 5-11; and free for children under 4. Family max is $25. Cheese pizza and carryout are also available. The St. Agnes Knights will host fish dinners from 5 to 7 p.m. in the St. Agnes School cafeteria, 5250 Mission Rd., Roeland Park. March 17 will feature corn beef and cabbage, while March 31 will feature a Mexican dinner. Family plan cost is $28. Knights of Columbus, Shawnee, will host shrimp dinners from 5 to 8 p.m. in the Knights Hall, 11221 Johnson Dr., Shawnee. Cost is: $13 for shrimp; $7 for kids shrimp; $8 for fish. Pizza is also available. A second serving is $3. For more information, contact Mike Reichmeier at (913) 927-5558. Mater Dei Parish will host fish dinners from 5 to 7 p.m. in the basement of Assumption Church, 8th and Jackson, Topeka. Cost is: $8 for adults; $4 for ages 6-12; and free for children 5 and under. Knights of Columbus Council 7909 will host fish and shrimp dinners from 5 to 7 p.m. at Prince of Peace Church, 16000 W. 143rd St., Olathe. Cost is: $9 for fish and $14 for shrimp. Knights of Columbus Council 1149 will host its annual fish dinners from 5 to 7 p.m. at Holy Trinity School, 601 E. Chippewa, Paola. Cost is: $10 for adults; $5 for children age 5 to 12; and free for children under 5. St. Aloysius at St. Paul Council 1913 will host baked fish, butterfly shrimp and fish strip dinners from 5 to 7 p.m. in the activity center, 900 S. Honeysuckle Dr., Olathe. Carryouts are available. Cost is: $9 for age 13 and older, $5 for ages 6 to 12; and free for ages 5 and under. Church of the Ascension Knights of Columbus will host fish dinners from 5 to 7:30 p.m. at the church, 9510 W. 127th St., Overland Park. Carryouts are available. Cost is: $9.50 for adults; $5 for children; and free for children under 5. Complete menu and details are online at: www.ascensionkofc.com. Leavenworth Knights of Columbus, 4th and Cherokee, Leavenworth, will host Lenten dinners each Friday except March 17 and Good Friday. There will be fried shrimp, catfish and baked tilapia. Cost is: $9 for adults; $16 for couples; $5 for children under age 14; and free for children under 6. Carryouts are available. The Sacred Heart Knights of Columbus will host fish dinners from 5 to 7 p.m. in the school multipurpose center, 21801 Johnson Dr., Shawnee. There will be smoked salmon and other fish. Cost is: $11 for adults; $10 for seniors age 65 and older; and $5 for children ages 4-12. For more information, send an email to: mark.dunn.fs@gmail.com. The Nativity Knights of Columbus will host fish dinners from 5 to 7:30 p.m. at the Church of the Nativity, 3800 W. 119th St., Leawood, in the parish hall. There will be fried and baked options plus shrimp. For more information go to: www.knightsofnativity.com. The Knights of Columbus of Sacred Heart Parish, Tonganoxie, 1100 West St., will host Lenten dinners from 4 to 7 p.m. Cost is: $8.50 for adults; $8 for seniors; and $3 for children ages 5 to 12. Shrimp and fish dinners will be March 17 and April 7 only. Cost is: $15 for adults; $14.50 for seniors; and $7 for children. St. Patrick Parish, 94th and State Ave., Kansas City, Kansas, will have Lenten dinners from 4:30 to 7 p.m. Cost is: $10 for cod, catfish and fried shrimp; $11 for boiled shrimp; and $30 for families. For more information, call (913) 515-0621. Queen of the Holy Rosary, 7023 Metcalf, Overland Park, will host a baked cod and boiled shrimp dinners. Cost is: $10 for adults; and $6 for children 11 and. For more information and a complete menu go to: www.queenofthehlyrosary.org. Carryouts available. Sacred Heart Knights of Columbus Council 11917 will host an all-you-can-eat fish dinner March 10 from 5 to 7 p.m. at 2646 S. 34th St., Kansas City, Kansas. Cost is: $9 for adults; $8 for seniors; $6 for children under 12. For more information, go online to: www.shkofc11917.weebly.com or call (913) 850-3348. Curé of Ars Knights will have a fish dinner on March 24 from 5 – 7:30 p.m. in the school cafeteria, 9401 Mission Rd., Leawood. Cost is: $15 for adults; $10 ages 5-18; under 5 eat free; and $40 for families. Walk-ups are welcome. For reservations or carryouts, call (913) 648-6355. St. Gregory Parish, Marysville, will host fish dinners on March 3, 10, 17 and 24 from 5 to 7 p.m. at the church hall. Carryout and in-town delivery available. All proceeds go to St. Gregory School. St. Patrick Parish, Emerald, will host a fish dinner following the 6 p.m. Stations of the Cross and Mass on March 17. St. Joseph Parish, Waverly, will host a fish dinner following the 6 p.m. Stations of the Cross and Mass on March 24. Knights of Columbus Council 3185 of Wheaton-Onaga will have its annual fish dinner from 5:30 to 7:30 p.m. on March 24 at the Onaga Community Center. St. Benedict School, 201 Division St., Atchison, will host a fish dinner on April 7 from 5 to 7:30 p.m. in the school commons. Cost is: $8 for adults; $5 for children 7 and under. For more information, go online to: www.stbenedictatchison.org/school. Holy Cross Knights of Columbus are hosting two Irish-themed Lenten dinners on March 10 and 17 at the Church of the Holy Cross, 8311 W. 93rd, Overland Park. Dinner will begin after the 5:30 p.m. Stations of the Cross. Proceeds will benefit the Don Bosco Center. The St. Bede Knights of Columbus will host a fish dinner from 4:30 to 7:30 p.m. on March 17 in the church basement at Kelly. St. Theresa Parish, 209 3rd St., Perry, will host a fish dinner from 5 to 7 p.m. on March 31 in the parish center, featuring fried fish and salmon patties. Cost is $9 for adults; $4 for children 10 and under. Carryouts are available by calling (785) 597-5558. Curé of Ars, Leawood, will host a shrimp dinner from 6 to 9 p.m. on March 31. Tickets are $15 and will be on sale after each Mass on March 11/12 and 18/19 or by emailing: NancyRRuf@gmail.com. This is an adult-only event. Holy Family Social Club, 513 Ohio, Kansas City, Kansas, will host a jumbo shrimp night on March 3 from 5 to 8 p.m. Advance reservations are required. Cost is $15 for adults; $3 kids menu (cheese pizza or mac and cheese). For reservations, call (816) 797-8623 or (913) 371-1561. The Knights of Columbus of St. John Paul II Parish, Olathe, will host fish dinners from 5 to 7 p.m. on March 24 and 31 at Madison Place Elementary School, 16651 Warwick St., Olathe. Cost is $10 per person or $35 per family. Knights of Columbus Council 13394 will host a fish dinner beginning at 5 p.m. on March 3 at the Corning Community Center, 5th and Main, Corning. Carryouts are available. The Didde Catholic Campus Center, 1415 Merchant St., Emporia, will hold its annual fish dinner on March 3 from 5 to 7 p.m. The menu includes shrimp. Call (620) 343-6765 for more information. The Greeley Knights of Columbus will have fish dinners on March 10, 24 and April 7 at St. John’s Hall. Cost is: $10 for adults; $5 for children. Carryouts are available. The St. Peter Cathedral Knights Council 12026 will have fish dinners from 5 to 7 p.m. on March 3 and 10 in the parish center, 14th and Sandusky, Kansas City, Kansas. Cost is a freewill offering. Butler Council 2278, Blaine, will host its annual fish dinner from 5 to 8 p.m. on March 10 at the St. Columbkille Parish hall. Cost is a freewill offering. Donations will go toward the church restoration. St. Philip Neri Council 10786 will have fish and shrimp dinners from 5 to 7 p.m. March 3 and March 31 at St. Philip Neri Church, Osawatomie. Cost is: $12 for adults for shrimp; $9 for adults for fish; $6 for children ages 6-12; and children under 5 are free. St. Francis Xavier Parish, Burlington, will host a fish dinner following the 6 p.m. Stations of the Cross and Mass on April 7. 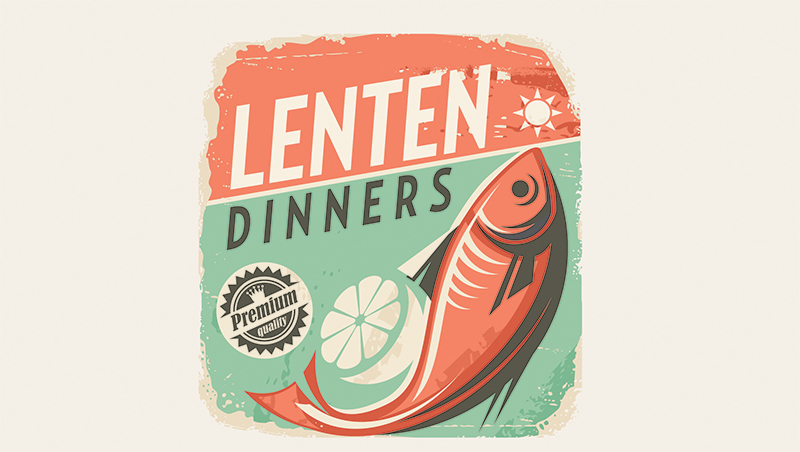 The Knights of Columbus of Holy Angels Parish, Garnett, will host their annual Lenten fish dinner from 5 to 7:30 p.m. on March 3, 17 and 31 at the Garnett Knights Hall. The Holy Name Knights of Columbus will host Lenten dinners from 5 to 8 p.m. March 3, 10, 24 and 31 at Holy Name School cafeteria, 1007 Southwest Blvd., Kansas City, Kansas. Cost is $8 per person. Annunciation Church, Baldwin City, will host fish dinners from 5 to 7 p.m. on March 3, 24 and April 7. Cost is $8 for adults. The Rosary/Altar Society, Sacred Heart Parish, Emporia, will host its annual Lenten soup suppers every Wednesday March 8 to April 5 from 6-7 p.m. in the Sacred Heart Parish hall. Cost is a freewill offering. The fourth annual pasta dinner hosted by the Sacred Heart, Emporia, Boy Scout troop will be held from 5 to 7 p.m. on March 10 in the parish hall. Cost is $8. The Holy Trinity, Lenexa, Knights of Columbus host an all-you-can-eat shrimp dinner on March 31, from 5:30 until 8:30 in the parish center. Tickets can be purchased after all Masses the weekends of March 18 and 18 and March 24 and 25, or on line at www.htknights.org. For more information, call Dave Leiker at (913) 957-9262.